Imprint: Screen Printing (SP): Price includes a 1-color barrel imprint. 3 colors available on barrel, 1 color on clip. Add $.12 per pen for each additional imprint color or clip imprint. See diagram for imprint areas, location and number of colors. Product Colors: Black, Navy, Blue, White (trim only), Red Choose 1 barrel and 1 trim color. Please note that barrel and trim colors may not be an exact color match. 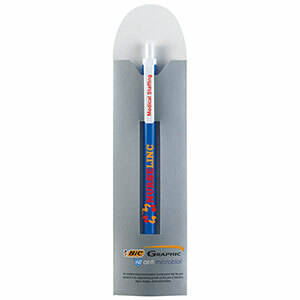 Point Style / Ink Color / Options: Medium Point / Black, Blue, Red Fine Point / Black, Blue Ink Options: BIC® Easy-Glide System® Ink option. Add $.05 per pen.